“Things are getting curious and curiouser at the Cirque du Soleil,” said the Montreal Gazette this morning, as Cirque du Soleil revealed the unusual moniker for its newest touring production today: KURIOS – the Cabinet of Curiosities, directed by Michel Laprise. Presented under the Big Top in Montréal’s Old Port starting April 24, the show will then go to Quebec City as of July 24 and Toronto on August 28. Step into the curio cabinet of an ambitious inventor who defies the laws of time, space and dimension in order to reinvent everything around him. Suddenly, the visible becomes invisible, perspectives are transformed, and the world is literally turned upside down in a place that’s as beautiful as it is mysterious. In this realm set in the latter half of the nineteenth century, reality is quite relative indeed as our perception of it is utterly transformed. The name of the show refers to the humble and strange characters that inhabit the Seeker’s Cabinet of Curiosities. KURIOS – Cabinet of Curiosities takes is inspiration from the latter half of the 19th century, when railroads made long-distance travel easier and inventions like the telegraph improved communications. “For the people of the 19th century, everything seemed possible,” Laprise said. KURIOS is an ingenious blend of unusual curiosity acts and stunning acrobatic prowess from Cirque du Soleil. Let KURIOS show you that anything is possible through the power of imagination. Michel Laprise worked in theater for nine years as an actor, director and artistic director before joining Cirque du Soleil in 2000. Even before he was out of theatre school, Michel had started his own creation company, Théâtre Pluriel, which spawned the innovative productions Fenêtre sur Qui?, Tonalités and Masculin-Féminin that have garnered both popular and critical acclaim. He also went on international tours with the Théâtre des Deux-Mondes as well as with the duo formed by Michel Lemieux and Victor Pilon. At Cirque du Soleil, Michel spent five years as a talent scout before taking on, in 2006, the role of Special Events Designer. In that capacity, he directed the act with Quebec diva Diane Dufresne during the Opening Ceremonies of the Montreal 2006 Outgames; the large-scale performance event created for the launch of the Fiat Bravo in Italy (2007); the Cirque du Soleil performance event celebrating Quebec City’s 400th anniversary (2008); the launch of Microsoft’s Kinect console at the 2010 Electronic Entertainment Expo, broadcast on MTV; the opening show at the Eurovision Song Contest held in Russia in 2009; and the Opening Ceremonies of the 2010 FIBA International Basketball Federation World Championships in Istanbul. In 2012, Michel collaborated with pop star Madonna, providing artistic direction for her performance at the Super Bowl XLVI halftime show; he later went on to direct her MDNA tour. In 2013, he directed the musical Robin des Bois – Ne renoncez jamais, to be presented in France, Belgium and Switzerland. A graduate of the National Theatre School in Montreal, Michel Laprise studied at London’s Royal Academy and at the Scuola Internazionale dell’Attore Comico in Reggio Emilia (Italy) as an Acfas grant holder. KURIOS – Cabinet of curiosities is Michel Laprise’s first engagement as Director of a Cirque du Soleil touring show. At the end of the 1980s, while living in New York pursuing a career in dance, Chantal Tremblay decides to join Cirque du Soleil after having seen one the company’s shows. Chantal started out as a dancer on a Cirque project and then became choreographer Debra Brown’s assistant on the creation of Mystère. Before KURIOS –Cabinet of Curiosities Chantal has worked on many Cirque projects including the shows Alegría, La Nouba and Mystère for which she once was the Artistic Director. In 2006, she becomes the Director of Creation for The Beatles LOVE, followed by OVO in 2009, Michael Jackson THE IMMORTAL World Tour in 2011. Stéphane Roy has worked as both a set designer and artistic director on over 100 productions in Montreal and abroad among which L’Odyssée, directed by Quebec playwright Dominic Champagne, at the Théâtre du Nouveau Monde (2002), and Les Âmes mortes, directed by Gilles Maheu, at Carbone 14 in Montreal (1996). Since 1990 he has designed sets for dance productions by such internationally-acclaimed dance troupes as La La La Human Steps and O Vertigo.While primarily active in theatre and dance, he has also worked in film, television, advertising and variety shows. Since 2011, Stéphane has been one of three artists in residence appointed by the Montreal Nature Museums group to create organic links between the city’s four natural science museums. He also designed The Warrior Emperor and China’s Terra Cotta Army exhibition at the Montreal Museum of Fine Arts in 2011. His achievements have earned him many awards and honors, including being named Revelation of the Year, All Categories Combined, by the Association Québécoise des Critiques de Théâtre in 1989. In 1992, the same association honored him with the award for best set design. His talent has also been recognized by the Conseil des Arts de la Communauté Urbaine de Montréal, the Academy of Canadian Cinema and Television and the Académie Québécoise du Théâtre. For Cirque du Soleil, Stéphane designed the set for Dralion, Varekai, Zumanity, KOOZA, Zarkana and KURIOS – Cabinet of curiosities. Philippe has worked for many high profile French movie and theatre directors. Since 1985, he has had a long working relationship with the renowned French choreographer Philippe Decouflé for whom he designed the astonishing costumes seen in the opening and closing ceremonies of the 1992 Winter Olympics in Albertville, France. He also worked with Decouflé on the opening ceremonies of the 50th Cannes film festival in 1997 and Tricodex, a multimedia work for the Ballet de l’Opéra de Lyon, in 2003. Between 2001 and 2005, his designs were featured in four ballets, including La Belle, staged by the Ballets de Monte Carlo. In cinema, Philippe designed the exuberant costumes for the 2002 feature film Astérix & Obélix: Mission Cleopatra, for which he received a César award, and prior to that, the films Doggy Bag and À la Mode. In 2007 he designed the costumes for choreographer Jean-Christophe Maillot’s production of Gounod’s Faust in Wiesbaden. He has been equally active in the world of live shows, designing the costumes for the musical Starmania in 1995 for Canadian composer and director Lewis Furey, and videos for a number of artists such as Julien Clerc and Alain Souchon. With KURIOS – Cabinet of curiosities, Philippe Guillotel collaborates with Cirque du Soleil for the third time after The Beatles LOVE and IRIS. After studying the piano and writing at Conservatoire national de région de Toulouse, Raphaël Beau deepened his knowledge of musical language at the Conservatoire national de région de Paris with Jean-François Zygel. At the same time, he undertook musicology studies at Université de la Sorbonne in Paris and became a certified music teacher (holder of the agrégation). From 2000 to 2004, Raphaël goes on a European tour with the band Spook and the Guay and performs in several festival in France including Les Vieilles charrues, Le Printemps de Bourges, Le Fête de l’humanité. The tour also took him to the Zigets Festival in Budapest and the BAM Festival in Barcelona, among others. In 2008, he turned toward composing for orchestra and wrote the music for Georges Feydeau’s musical L’Âge d’or staged by Yves Pignot. In 2009, he composed the original music for Jean-Pierre Jeunet’s latest motion picture Micmacs, a director with whom he collaborated again in 2010 on a commercial. In 2010, he composed the music for “Grants,” an Australian advertisement for Commonwealth bank made by Jeunet. A year later, he composed the soundtrack for Defective Detective, a short American animation film written by Avner Geller and Stevie Lewis – winners of the 38th Student Academy awards – picking up an award at the Burbank International Film Festival. With KURIOS – Cabinet of curiosities, Raphaël Beau writes his first score for a Cirque du Soleil show. It was in his early teenage years that Yaman Okur discovered his love for dance. After only a year of refining his talent as a student of contemporary dance, ballet, and jazz at the Académie Internationale de Danse (France), he was invited to join the French crew of “Trafic de Style” before becoming an integral dancer of “Wanted Posse” in Paris in 1999. Only a few years later in 2001, Yaman took home the remarkable title of BBoy World Champion at the International Battle of the Year in Germany. Yaman, though anchored in hip-hop, further perfected his own style over the years, which resulted in his first place win in the Experimental category of Juste Debout’s 2007 competition in France. His acute sense of music and unparalleled body control have led him to win numerous battles and competitions. He finished third at the 2010 TV series La France a un incroyable talent. His choreographic abilities and work have been recognized both nationally and internationally, reflected in works created for his own dance crew, Pro Phenomen to work for Madonna (Sticky and Sweet and MDNA tours). Yaman Okur takes part in the creation of a Cirque du Soleil show for the first time with KURIOS – Cabinet of curiosities. A former national competitive gymnast, Ottawa-born Ben Potvin joined Cirque du Soleil as an artist during the creation of “O” in 1997. He performed on this show for six years and acted as coach-performer for the production’s aerial hoops act. In 2004, he joined Dragone as an artist, coach-performer, dance captain, talent scout and act designer. In 2009, he came back to Cirque du Soleil as a head coach on the show Viva ELVIS and later took on the acrobatic development role during the creation of Michael Jackson THE IMMORTAL World Tour and Amaluna. After Michael Jackson ONE, KURIOS – Cabinet of curiosities marks Ben’s second assignment as Acrobatic Choreographer, a mandate in which he leverages his vision and experience in both the acrobatic and artistic realms. Sidi Larbi Cherkaoui has worked for theaters, opera and dance companies, ranging from the Ballets de Monte-Carlo, Sadler’s Wells in London, the Grand Theatre of Geneva to Les Ballets C. de la B. His choreographies have earned him a series of prizes including a Benois de la Danse, two Laurence Olivier Awards and two National Dance Awards. In 2008 and 2011 Tanz magazine proclaimed him ‘Choreographer of the Year’. In 2010, he founded his own company. For Eastman he created Play with Shantala Shivalingappa and Babel(words) with Damien Jalet and Antony Gormley. In 2011 he set up TeZukA, a piece for 15 dancers and musicians inspired by the Japanese manga author Osamu Tezuka. In 2012 he created Puz/zle with the Corsican men’s choir A Filetta, Lebanese singer Fadia Tomb El-Hage and Japanese musician Kazunari Abe. That same year he helmed the choreography for Anna Karenina, Joe Wright’s movie. In 2013, Eastman was recognized as a European cultural ambassador and Sidi Larbi Cherkaoui created 4D, a production composed of four duos, as well as ?? GENESIS, co-created with Chinese dancer Yabin Wang. KURIOS – Cabinet of curiosities is his second collaboration with Cirque du Soleil after Michael Jackson ONE. Susan Gaudreau has worked as a dancer and choreographer for over 20 years in a variety of styles that include contemporary dance, jazz, ethnic, tap and classical ballet. She has worked with a number of Montreal dance companies such as Rubberband Dance, FLAK, Cas Publique and La La La Human Steps, among others. From 1989 to 2008, she was principal dancer, dance captain and assistant to the artistic director at Les Ballets Jazz de Montreal, for which she choreographed Rhythm #5 (2000) and ZAP (1996). Throughout her career, Susan took part in a number of projects as a freelance artist. She danced in YES (2001), created by Debra Brown and René Bazinet, collaborated on television specials and variety shows, and was involved in a series of special events for Cirque du Soleil in Canada and abroad. Susan Gaudreau lent her talents as artistic coach to Cirque du Soleil’s Michael Jackson ONE and was assistant to the choreographer on Amaluna, Michael Jackson THE IMMORTAL and Zarkana. KURIOS – Cabinet of curiosities is her first engagement on a Cirque du Soleil show as choreographer. For over 25 years, Jacques Boucher has been creating sound environments for a number of productions from Quebec and beyond. Jacques also worked as a sound technician for various Quebec artists, including Richard Séguin, Laurence Jalbert, Diane Dufresne and Bruno Pelletier. He went on to develop an expertise in sound design for musicals such as Dracula (2006) and large-scale events, including the mega-show 2000 voix chantent le monde, presented in Quebec City in 2000, with over 2,300 singers on stage. In 2008, Jacques was asked to handle the sound for almost every event presented as part of the celebrations for the 400th anniversary of Quebec City. As Sound Designer and Head of Sound, he designed sound for the Quebec Symphony Orchestra’s performance of the Symphonie des mille by Gustav Mahler, The Image Mill by Robert Lepage, for which he designed the impressive sound system spanning 1.2 km, and the special show presented by Cirque du Soleil. Jacques also works as Sound Designer and Head of Sound for some Cirque du Soleil special events. After TOTEM and Amaluna, he is taking part in his third Cirque du Soleil show with KURIO – Cabinet of curiosities. Jean-Michel Caron has spent the past 20 years in the realm of sound and KURIOS – Cabinet of curiosities is his first engagement as Sound Designer of a Cirque du Soleil show. Jean-Michel has been creating soundscapes for the past five years, including for a number of Cirque du Soleil special events. He took part in several productions by new media and entertainment studio Moment Factory including Ode à la vie, a multimedia show projected on the façade of the Sagrada Familia (Barcelona) in 2012. He also worked on various exhibition and theatre projects in Quebec. At Cirque du Soleil, Jean-Michel was involved in a number of creations as Project Manager and Head of Sound. He was also Assistant Sound Designer on the shows OVO and Zarkana, an experience he repeated on TOTEM and Amaluna alongside Jacques Boucher. Since 2012, Jean-Michel Caron teaches sound at Collège d’Alma, in Quebec. Martin Labrecque’s professional credits include more than 140 theatrical productions, as well as circus shows. Martin contributed to the critical success of several Quebec shows. He has won many Quebec awards for his lighting design in addition to several nominations. Martin Labrecque created the lighting for two critically acclaimed circus shows produced by Cirque Éloize, Rain and Nomade, as well as Cirque du Soleil shows Corteo, KOOZA, Viva ELVIS and Michael Jackson THE IMMORTAL World Tour before KURIOS – Cabinet of curiosities. In 2009, Martin designed the lighting for an eleven-hour show by Canadian author, director and actor Wajdi Mouawad, which was presented in the courtyard of the Palais des Papes in Avignon, France. He also worked on the show Paradis Perdu, directed by Dominic Champagne and presented in Montreal and Belles Soeurs (2011) directed by René Richard Cyr. Rob Bollinger was a competitive trampolinist at the age of 9 and partnered with his father on the invention of the double mini trampoline as his family owned a trampoline club in Illinois, where he grew up. He studied Business at Indiana University on a scholarship as a competitive springboard diver. He won two Big Ten and two NCAA national diving championships and qualified for the 1980 and 1984 Olympics trials. He did not make the team on either occasion, and at first turned away from the world of competitive sports. After a brief period working in aeronautics and insurance, Rob found the pull of acrobatics too strong to resist, so he went to work in diving shows in theme parks, which led him around the world. On his return to the United States he put his talents as a diver and trampolinist to work in film and television as a professional stunt man, notably for Universal Studios. Rob joined Cirque du Soleil in 1993 during the creation of the first resident show Mystère as a coach and artist in the show’s original house troupe. In 1997 he joined “O”, first as a coach, then as artistic coordinator and eventually he was appointed the production’s artistic director. He also added the artistic direction of Mystère to his responsibilities. KURIOS – Cabinet of curiosities is Rob’s third show as Acrobatic Performance Designer after ZAIA, Amaluna and Michael Jackson ONE. Germain Guillemot began attending circus schools at the age of 11 and completed his studies eight years later at the Centre national des arts du cirque de Châlon-en-Champagne in France. After touring with various circus companies including Cirque Archaos, he created the French circus company Les Arts Sauts with other circus fellows where he worked both as a creator and performer for 15 years. Germain joined Cirque du Soleil in 2007 as a coach for the flying trapeze act on ZED and then became Acrobatic Training Manager for Viva ELVIS. 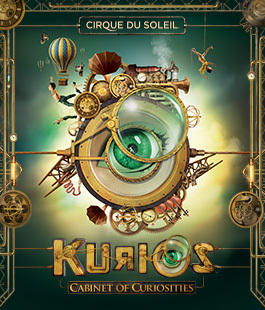 KURIOS – Cabinet of curiosities is Germain Guillemot’s third collaboration with Cirque du Soleil as Acrobatic Performance Designer after Michael Jackson THE IMMORTAL World Tour and Michael Jackson ONE. Following his graduation from the Institute of Physical and Sports Culture in Minsk, Belarus with a degree in Physical Education and Sports, Boris Verkhovsky rose through the ranks to become a coach of the national acrobatics team of the former Soviet Union. Boris emigrated to Canada in 1978 and eventually became Head Coach of the Canadian national trampoline and tumbling team, and was approached by Cirque du Soleil in 1993 to consult on a proposed tumbling act for the Las Vegas resident show Mystère. He was subsequently named Head Coach of Acrobatic Training at Cirque du Soleil and is currently Director of Performance Design and Development. Although KURIOS – Cabinet of curiosities is Boris’ second “hands-on” Cirque du Soleil show as Acrobatic Performance Designer after IRIS, he has been deeply involved in the development and creation of every Cirque production since he joined the company. Danny Zen first arrived at Cirque du Soleil in 1990 to work as a welder in the company’s workshops. That same year he went on the first European tour of Le Cirque Réinventé, then moved on to Nouvelle Expérience on which he worked as a welder, assembler, mechanic and head usher. In 1992 he toured with Saltimbanco as a tent technician. Danny has worked at the National Circus School in Montreal and has, over the years, contributed to the design of most of the aerial acrobatic equipment used in the Cirque du Soleil shows Alegría, Mystère, Quidam, Dralion, Varekai, “O”, La Nouba and KÀ. He was also Head Rigger for Quidam in 1996. In 2008, he designed the rigging and equipment for the acrobatics show at the Quebec City 400th anniversary celebrations. KURIOS – Cabinet of curiosities is Danny Zen’s fourth engagement as Acrobatic Equipment and Rigging Designer for a Cirque du Soleil show, following Corteo, KOOZA and Zarkana. Eleni Uranis joined Cirque du Soleil in 1989 as Assistant to Costume Designer Dominique Lemieux. She then worked on various shows, where she was responsible for materials research, fittings and artistic quality control. She then designed costumes for the show Pomp Duck and Circumstance, performed in Hamburg (Germany) from 1997 to 1999. In 2002, she worked alongside world-renowned designer Thierry Mugler to design the costumes for Zumanity. In 2004, Eleni Uranis’ career took a sharp turn when she joined the Cirque du Soleil make-up workshop, where she would see her ideas brought to life by the artists of Dralion. Between 2004 and 2006, Eleni Uranis assisted Make-up Designer Nathalie Gagné with several shows and, in 2005, she designed the make-up for Reflections in Blue, the show Cirque produced for the opening ceremonies of the XI FINA World Aquatic Championships. With KURIOS – Cabinet of curiosities, Eleni is designing the make-up for her seventh Cirque du Soleil production after Dralion, Wintuk, ZED, Banana Shpeel, Zarkana and Amaluna. More about Kurios as Cirque du Soleil makes it public!